Posted September 17, 2013 by admin . Gone are the days of businesses relying on mediums such as the Yellow Pages for advertising. The thick, never ending books have been traded for today’s faster and more reliable technology. Online advertising has become an essential part of running a successful business. Bad exposure, or worse, no exposure can be detrimental to a company. But what exactly is Paid Search Advertising? Bottom line is if your online presence is non-existent, chances are your company may be headed in that direction too. With billions of web searches being made each month, online advertising is becoming an essential aspect of a comprehensive marketing plan. If you find yourself struggling to figure out PPC advertising, agencies such as AMG can help you start and manage your paid search campaigns. AMG provides professional management of your paid search campaigns through keyword research, high quality ads, geo-targeting, ad tracking, and bid management. Our goal is to help increase your overall revenue by increasing website and call traffic. 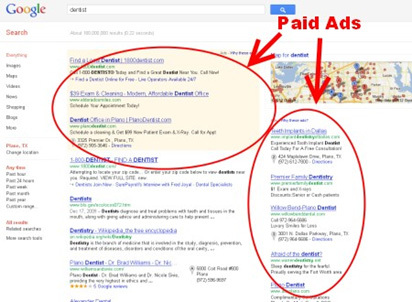 We can even help answer why you can’t see your paid search ad. Check out all of AMG’s marketing services that will help you develop an integrated marketing plan for your small business.